A friend from work was leaving the country indefinitely, so me and another friend (a native of Turkey) decided to take him out for a meal, a last exploration into Vancouver’s vast ethnic food offerings. 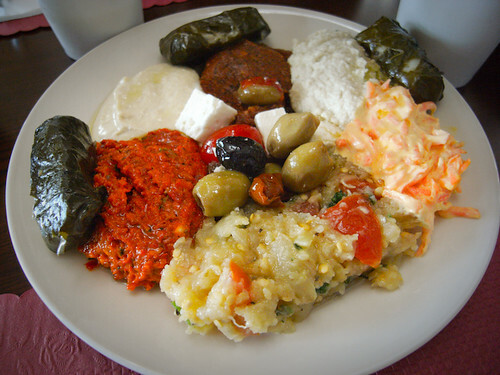 We ordered their mix plate of starters, which includes a large sampling portions of their cold dishes. (chickpeas, carrot, eggplant, tomato dips) These went perfect with their famous Lavosh flat bread. I ordered another plate of these to go for dinner. Though we had only 3 people, we ordered their group set meal (Padishah’s Table, $20/person), which was the biggest medley of food I have ever seen in my life. My favorite was the Lahmajun, a thin crust pizza with ground meat on top. Being a sendoff meal, we took our time eating, sipped on our ayran between bites while shooting the breeze. About an hour later, we finished the huge plate of food and were completely demolished. 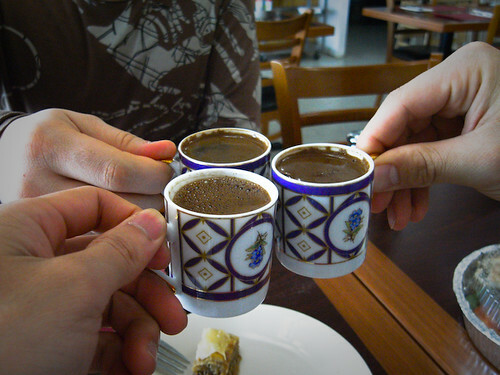 The only thing that could bring us back to consciousness was a shot of Turkish coffee. Brewed with the fine grinds in the cup, this coffee had bite. The meal, nay, feast, did the occasion justice. 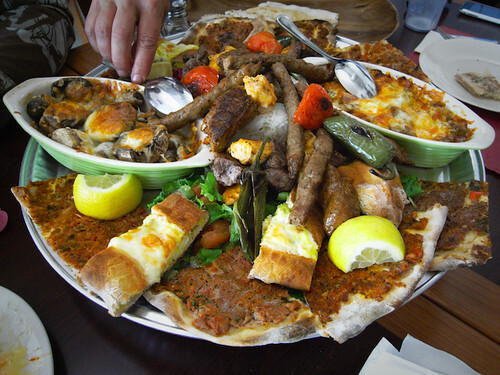 From what my Turkish friend says, the food is true to regular restaurants found in his home town. It drew many nostalgic tales of home out of him, and in turn, us. Everyone probably knows of one guy/gal who’s painfully modest, never dresses too flashy or speak out of turn, polite to everyone they meet, but performs laudable work, of which they hold a quiet passion for, and garner respect from peers because of it. Sunflower Cafe on Royal Oak reminds me of someone like that. 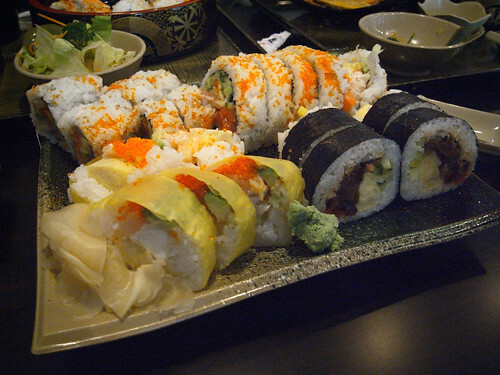 Like sushi, bubble tea and Taiwanese cafes are a dime a dozen in Vancouver with nearly equal price points. The fickle diner may change their mind about a restaurant over the slightest dissatisfaction. 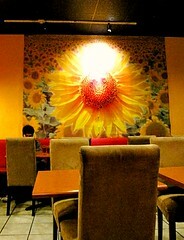 But after a dozen or so visits, Sunflower hasn’t let me down. Hidden (the good ones always are) behind a gas station in a mini plaza, Sunflower is a friendly Taiwanese style cafe serving food and bubble tea. Both the service and food has been above par. The decor and the large tacked on namesake poster covering half of the wall makes it all the more homey. We found ourselves almost alone during a late dinner last night and ordered up a few familiar items. Dry spicy beef noodle, slightly spicy, one of my favorite noodle dishes in Vancouver. 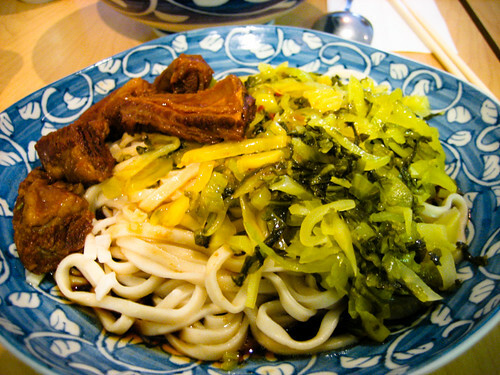 Stewed pork dry noodle. Got a nice bit of sweetness to it. Like a hearty soupless version of ramen. 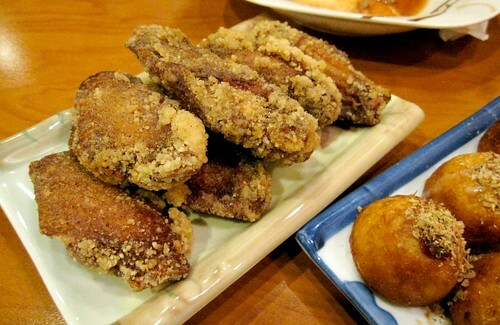 and fried chicken wings. The wings were really something, marinaded thoroughly with five spice and light on the oil, something I wouldn’t mind eating everyday of the week. 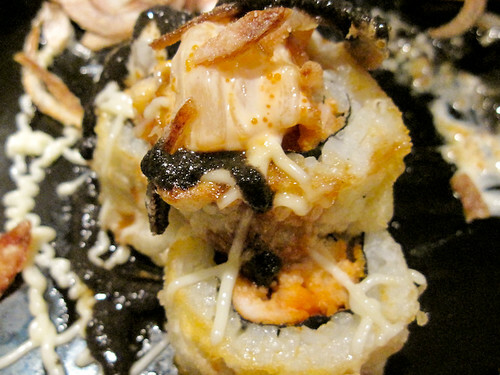 Sushi House on Kingsway has been my ‘go to’ place for reliable take out sushi for a few years now. 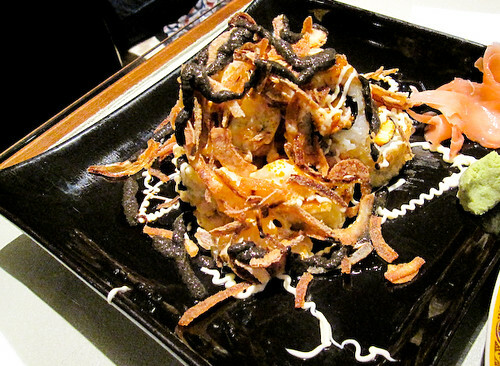 Recently, this once cramped restaurant reopened under the name Nao Sushi after major renovations to allow for a comfortable dine in experience. Their menu have also been adjusted slightly to match the sit down format (for better or worse), but I was relieved to find my old favorites were still offered. I ordered the ichi roll, pictured in the front row, lovingly named after Ichiro, with real crab and chopped scallop, futomaki roll, and cruncy roll. The angle of the picture doesn’t do a good job in conveying the monsterous size of their house roll in the back right. 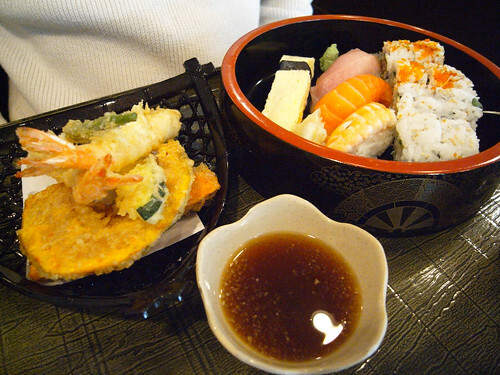 Sushi lunch box. A good sampling of the fundamentals. 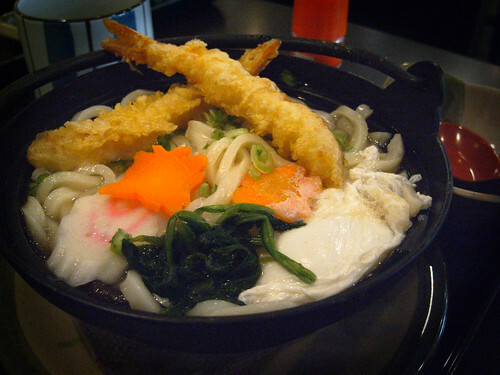 Nabeyaki Udon. More of a filler. 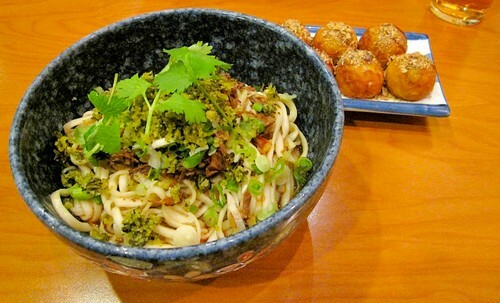 No noodles manage to impress next to ramen. One thing of note is that the tea served here is different than that of most other Japanese restaurants, being greener, stronger, and more fragrant. I’m not knowledgeable enough in teas to know what kind it is, but the only other restaurant I remember having it is Sushi Hachi. If anyone knows more about the differences, please do let me know. Likelihood of returning: You betcha. Accord is the smallest restaurant I’ve ever been to in Vancouver. Period. Their unostentatious interior is only two dining tables wide, total seating is about a dozen people, and with the open view of the kitchen it feels like the inside of a bachelor’s studio apartment. 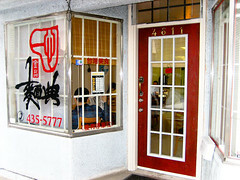 It is however, also the most authentic Taiwanese restaurant I’ve ever been to in Vancouver. According to the mom and pop owners, Accord has been open for 9 years in Vancouver. Its predecessor was owned and operated by the owner’s parents for 30 years in Taiwan. Family run and staffed, if it were a bit hotter inside, it’d be just like being transported to one of Taiwan’s back alley diners. 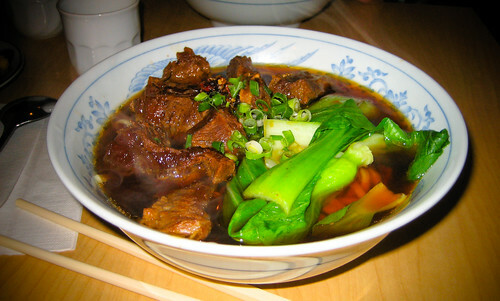 Beef noodles. Tasty soup and noodles that are just the right firmness, retaining some of the soup, making it a bit juicy. Dry beef noodles with pickled veggies similar to sauerkraut. I can never get enough of the pickled veggies. These are a bit lighter and sweeter than what I’ve had before. Though the name says dry, there is a bit of soup for you to mix your noodles in. 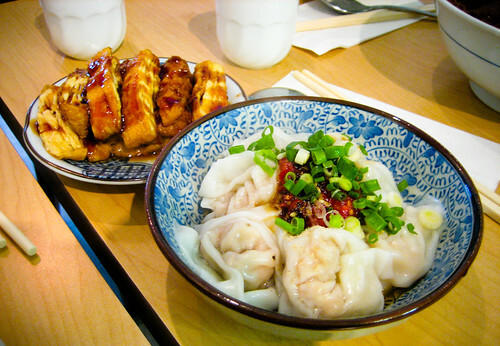 Bean curd and spicy wontons. I’ve found different restaurants make spicy wontons in different ways. Some will use a peanut and chili oil sauce, and some will use a chili oil and vinegar mix, while others will just have chili oil. In the end, if the wontons are poor, it doesn’t matter what condiments were added. Here we were served real and delicious wontons with chili sauce. This difficult to find gem is located on Kingsway, (map) opposite Metropolis. I have a soft spot for mom and pop diners. They are the archetypes of the love, and perseverance that goes into preparing good food. This place has got the fundamentals right. Good food from good people. That in itself is a monolithic task some never achieve. Do you know of any mom and pop restaurants you enjoy visiting and would like to share and help support? Comment and let us know!